Note: we've been informed that the following details contain several errors. Sunshine were a pop band whose history stretches back to the early 70s. As far as I know they were not directly related to the late 60s Belfast band called Sunshine? The band was formed circa 1972 by Stuart Bingham (guitar) and Bryce Norrie (vocals) with Sam Johnson (keyboards) and Barry Richardson (drums). The original name was Bang but given the time and place this was changed to Sunshine. The band was in limbo for for much of 1973 when Stuart joined Chips during Paul Lyttle's sabbatical in Lyttle People. Bryce Norrie joined Candy. Once Paul Lyttle rejoined Chips, Bingham attempted to reform Sunshine, but these plans came to nothing and Bingham had a stint in The Sands and did a tour of Canada with Tapestry, a cabaret group. Update: in fact, Stuart was also a member of Candy, and was in Pasado before that, so the exaxct sequence of events here is somewhat confused. Sunshine finally relaunched in 1974 with Bingham and Norrie joined by members of Tapestry Irene McIlroy, Shaun Magee and Ardy Moorhead. Magee was recruited by Chips to replace Robin Irvine and his replacement was Trevor England. Then Irene McIlroy joined Chips when Nicola Kerr left that band in 1975. Her replacement was Rosey Hunter. The band appeared on Opportunity Knocks in 1976 where their success (a sequence of 8 wins) led directly to a deal with EMI. They appeared on the Arrows TV series in November 1976 plugging one of their EMI singles. They made several guest appearances on Clubsound's TV show in Northern Ireland. On 20 February 1977 they appeared in the Irish National Song Contest, the competition for selecting the Ireland's entry for Eurovision. They song they performed was 'Look Before You Leap'. They also appeared on A Song For Europe, the UK's version of the same competition, in 1976 with 'Maria', finishing 7th, and in 1978 with 'Too Much In Love', finishing 8th. Sunshine released several singles during the late 70s and early 80s. These run the gamut from pop to disco to reggae. They split sometime in the 80s. The singles I've heard are competent but unexceptional (unless you're a big Dooleys fan). 1977's "Dance With Me" was described on ebay as "fairly rubbish" while it's B-side "Evil Eyes" was "a great powerpop track" from what the seller described as a "pub rock/powerpop band". "Boogie On Up" from 1979 is disco. "Double Dealin'" is pop with ska/reggae overtones, thanks mainly to the guest trombone of John Trotter, and is probably their best track. 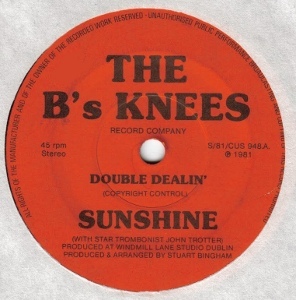 There are several more UK singles from the '70s recorded by different bands called Sunshine. The 1972 releases on Warner Brothers are unrelated. Rod McQueen's band Sunshine confusingly recorded for the same State Records label in 1976. A-side by Vance, Pockriss; B-side by Stuart Bingham. Arranged by Nick Ingman; Produced by Gil King for the Norman Newewll Organisation. A-side by Pockriss & Bernstein; B-side by Richard Gillinson. Notes: Both sides by the veteran songwriting team of Wayne Bickerton (who'd produced Granny's Intentions) and Tony Waddington. 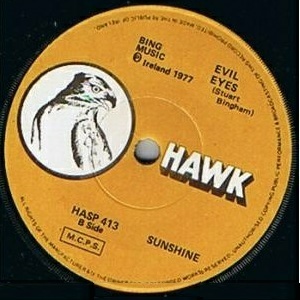 The A-side was a contender in A Song For Europe in 1978. This is definitely by the Stuart Bingham Sunshine. 7" - Release Records - RL 972 - 1979 - no PS? A-side by Paul Curtis, B-side by Robinson/Christy. 7" - Release Records - RL 1003 - 1980 - no PS? Both sides by Stuart Bingham..
Notes: Featuring guest trombone by John Trotter (Stars/The Plattermen). Arranged and produced by Stuart Bingham at Windmill Lane, Dublin. Notes: The A-side is written and produced by Barry Blue (arranged by Robin Smith). It was also recorded by Dollar in 1980 under a different title (unreleased) and in 1981 by The Dooleys on their Secrets LP (for some reason credit to Bowkett!). The B-side is written, arranged and produced by Stuart Bingham. 7" - Bees Knees Records - BK 102 - 1987? Notes: Undated but probably circa 1987, given the date of BK 103, though given the record label name and cat.nbr. I was tempted to list this as the follow up to Double Dealin'.